1. Download the OFFICIAL RULES. 2. Take a look at our great sample short film produced by Sabina England, a deaf filmmaker in St. Louis, to see how easy it is. 3. Create your 3-minute or less captioned/accessible short film. 5. You must include Sprint Relay logo on a single card at the front of the film for at least 3 seconds. Download logo on WHITE BG here, and logo on BLACK BG here. 6. Upload your film to our website by clicking on "UPLOAD VIDEO." You'll be directed to register, and create a user name and password. Choose the category that best suits your film's genre. You may upload as many videos as you wish. 7. Tell all of your friends to vote for your film. 8. Start preparing your Hollywood acceptance speech! 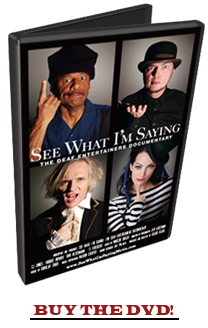 Your film doesn’t need to center on deafness, Sprint or SEE WHAT I’M SAYING: THE DEAF ENTERTAINERS DOCUMENTARY. It should just tell a great story. If you'd like to use music in your video without worrying about music licensing or copyright, download the See What I’m Saying theme song by Powder. 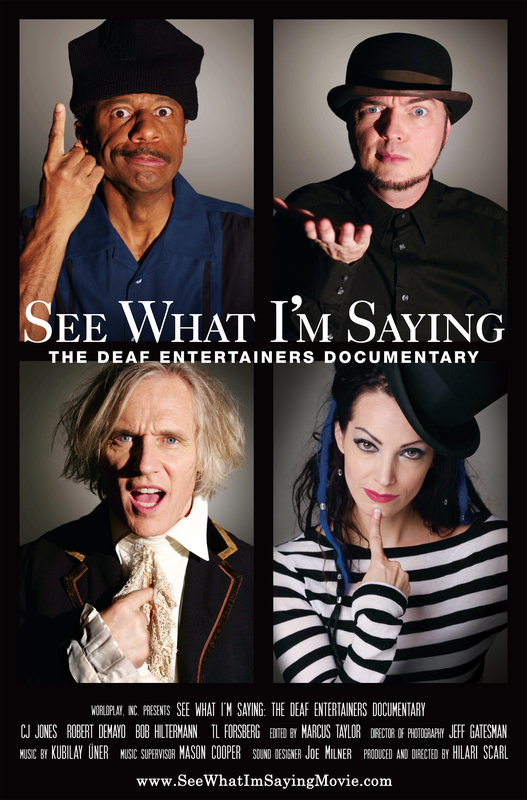 COMEDY EXAMPLE: Two people having a conversation, one clearly not understanding the other until one hold up a visual demonstration and remarks, “See What I’m Saying?” All dialogue is in sign language and captioned in English. DRAMA EXAMPLE: A hearing couple gets into an argument as one tries to convince the other they are right and uses the line, “See What I’m Saying?” All dialogue is spoken in English and is captioned in English. EXPERIMENTAL EXAMPLE: A street performer wears a t-shirt that says, “See What I’m Saying” while performing a visual act. We see a sign near their hat collecting change that reads, “See What I’m Saying” as the name of their act. DOCUMENTARY EXAMPLE: A deaf filmmaker interviews a chef in Chinatown about a new restaurant they are opening. The filmmaker remarks on camera at the end that they are happy that the menu has visual pictures, See What I’m Saying? The entire short uses spoken Chinese and American Sign Language and is fully captioned in English.